Here’s something I didn’t realise existed; Look Good Feel Better have a range of make-up brushes! For those of you who don’t know, Look Good Feel Better is the only worldwide cancer support charity, providing practical support for women struggling with the side effects from cancer treatment. Look Good Feel Better is dedicated to improving the self-esteem, confidence and wellbeing of people undergoing treatment for any sort of cancer; they do this through free group and self-help skincare and make-up workshops. Now, back to the brushes! Each precision cut brush head has been hand-made using super soft taklon bristles; making them allergy free, cruelty free and suitable for sensitive skin. 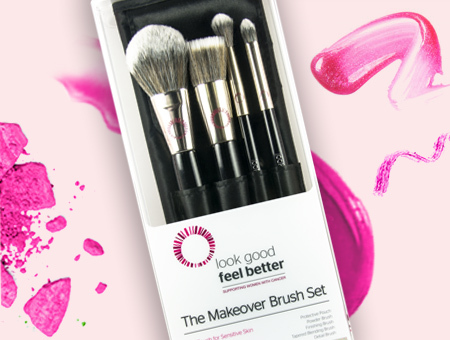 An 8% – 12% donation will be made to Look Good Feel Better from the sale of each brush and set and Bespoke Europe have generously guaranteed a minimum donation of £30,000! The money raised will enable Look Good Feel Better to expand their confidence-boosting Workshops and Masterclasses, which teach skincare and make-up tips to women and teenagers undergoing cancer treatment.